North co-founder Aaron Grant tries on Vuzix Blade smart glasses at the Pepcom Digital Experience. 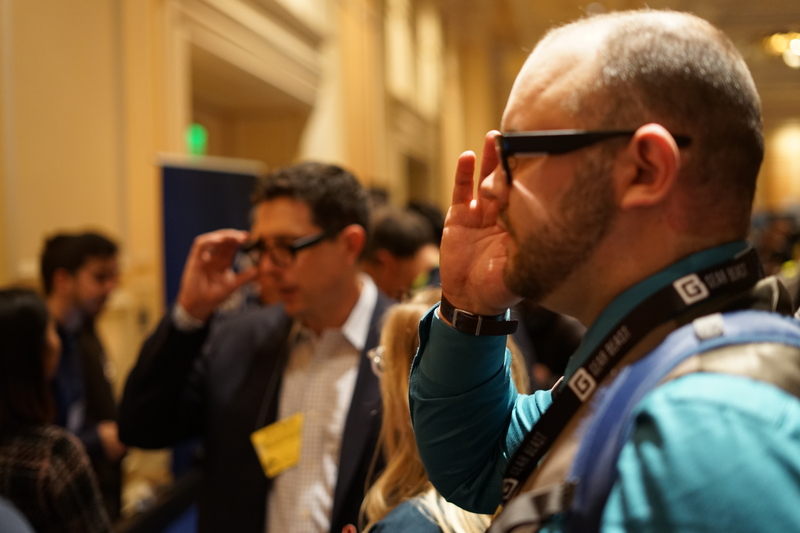 At the Pepcom Digital Experience taking place during CES 2019, North co-founder Aaron Grant is approached by another smart glasses vendor, who extends a pair for him to try on. In an “I’ll show you mine if you show me yours” moment, Grant slaps a pair of Vuzix Blade smart glasses on for a quick demo [see featured image at top]. It’s exactly the same thing that the busy North team is facilitating for hordes of bloggers and journalists that approach the Focals by North booth. North has learned that getting people to try on Focals is an important step of communicating the product’s value. 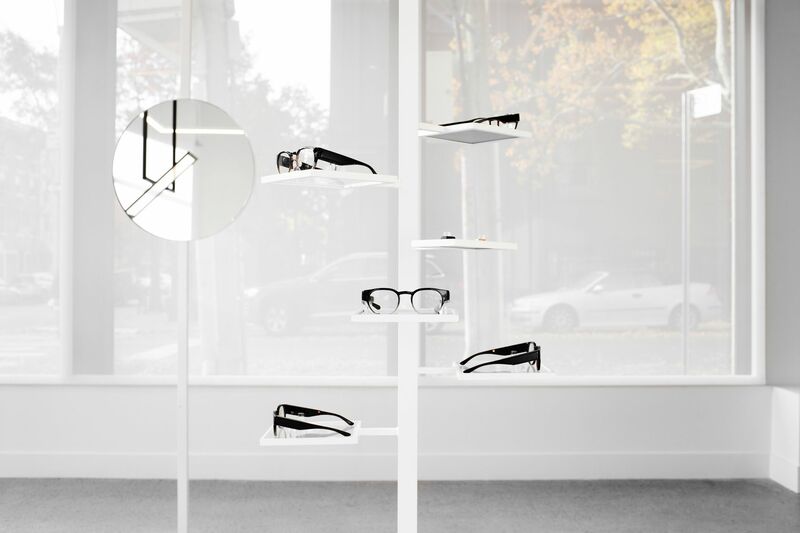 The importance of that simple act of putting the glasses on is just one of that’s come into focus for North in the short time it’s operated a retail operation for a brand new category of product. While both Vuzix and North are selling smart glasses, their go-to-market strategy is entirely different. Vuzix focuses on a partner program to get its smart glasses to businesses that could boost productivity by distributing them to workers that constantly have their hands busy. Waterloo, Ont.-based North (formerly Thalmic Labs) is eyeing a direct-to-consumer approach complete with an Apple-esque retail experience. 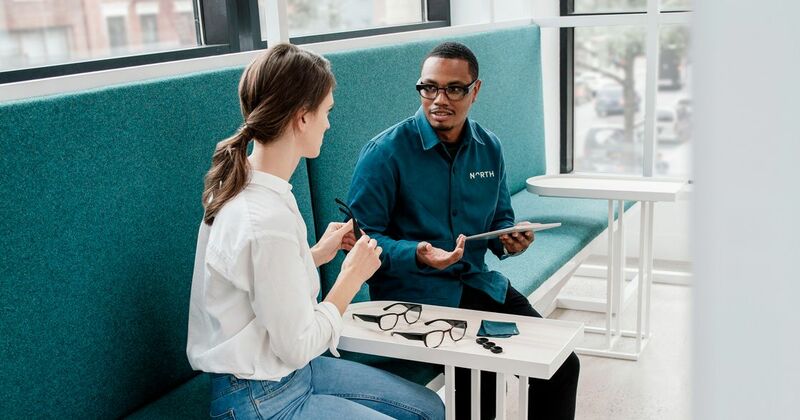 Last October, North announced its rebranding and unveiled its new smart glasses product to the world. 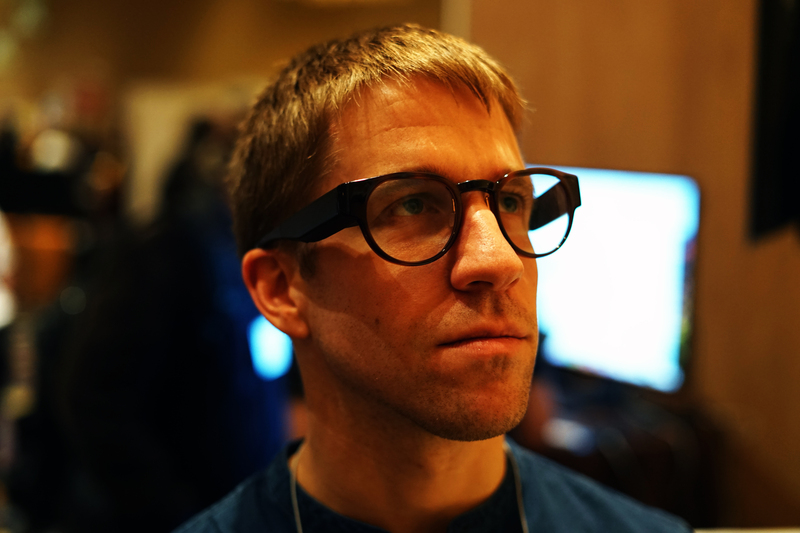 Co-founder Stephen Lake wrote that a five-year journey to create smart glasses that look like regular glasses. At the same time, the firm was preparing for its foray into the retail space. In June, it hired Adam Ketcheson as chief marketing officer, who previously had worked with outdoors apparel retailer Arc’terix Equipment Inc. That Vancouver-based firm has 32 branded stores worldwide – North is starting with two showrooms in Toronto and Brooklyn, with more locations planned for the future. Before those stores are opened later this year, Grant and his team will look at what they’ve learned from the first two. Media attending the Pepcom Digital Experience position Focals smart glasses so they can see the UI. 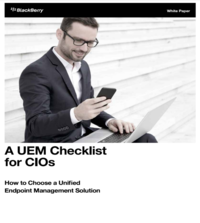 Once a prospective customer peers through the lens, seeing the unintrusive and hovering UI in front of them displaying the weather, calendar notifications, and turn-by-turn navigation, the purpose of the device clicks. The challenge for Focals is getting to that point, as its smartglasses require a precision fit in order to work correctly. Each buyer sits down to have their head 3D-scanned so the glasses can be custom-made in Waterloo. It’s getting interested customers to that point in the buying journey is the real trick. 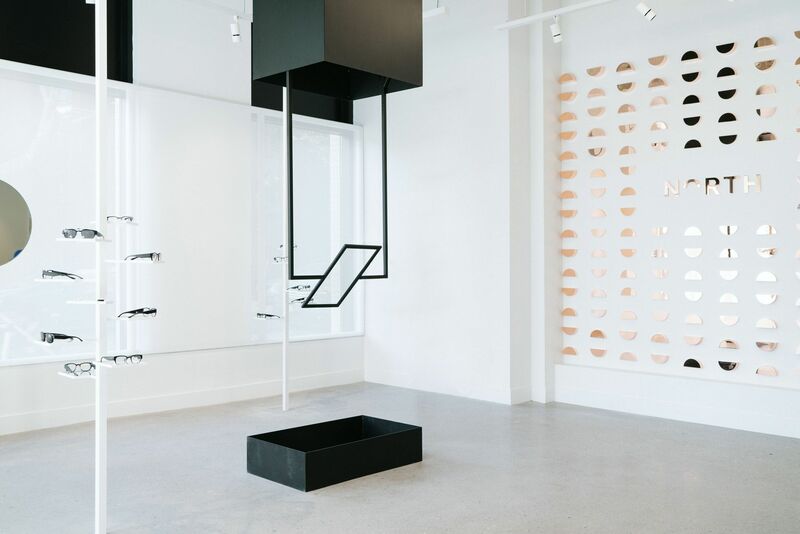 In the Toronto and Brooklyn retail stores, North has tried to showcase its UI with a transparent glass panel, making it appear as though it’s floating in space similar to the glasses experience. 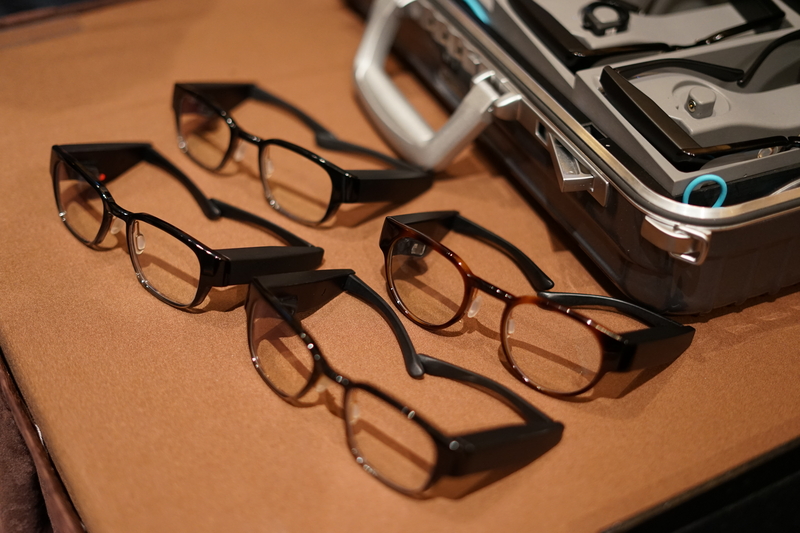 But that falls short of actually having customers try it on for size, which is why North is now offering some pre-sized Focals in stores as a demo. Aaron Grant, co-founder of North, is not only working to create demand for a new product category, he’s learning how to operate a bricks and mortar retail business. 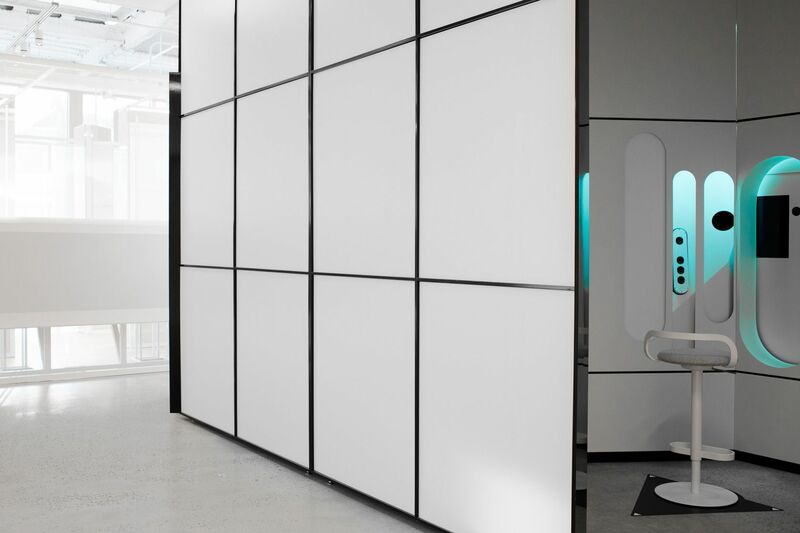 Helping it solve those changes is San Francisco-based architectural design firm Envelope a+d, which has helped design spaces for The French Laundry, Aether Apparel, and the San Francisco Museum of Modern Art. North will ship its Focals to its first paying customers that have come through its retail experience for the first time on Jan. 24. So far it hasn’t spent a ton on advertising for its product, instead focusing on getting a beta version of Focals into the hands of press and influencers, to create a buzz by word-of-mouth. 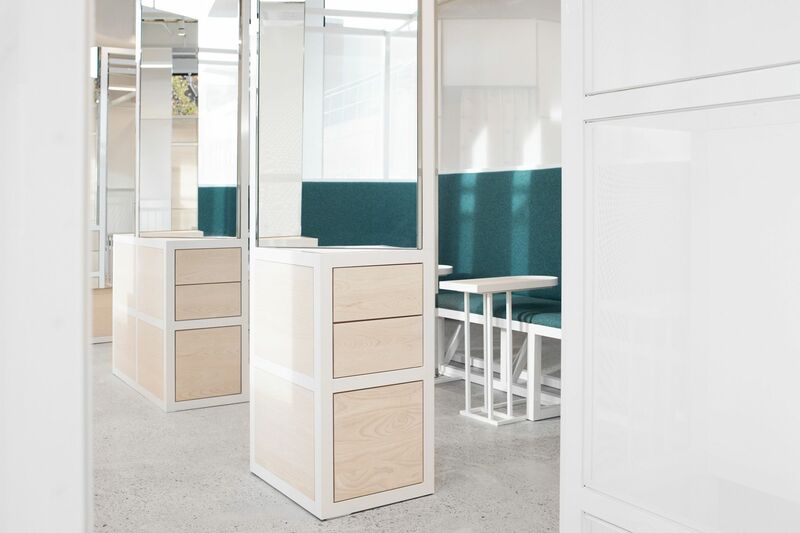 At the same time it’s figuring out the retail business, it’s still building out its new product category, solving challenges that no manufacturer has tackled before. In a couple of months time, it will start selling Focals to people that already need glasses to correct their vision. Whether North’s early retail efforts with Focals are a success, we don’t know. The firm’s not sharing how many devices it’s shipping come Jan. 24. But If it can solve problems that no other manufacturer has, maybe it has a shot at succeeding in retail too.